I saw Lalo at his last stop in Houston–at HCC Downtown–in September. The thing about listening to a lecture and slideshow from a editorial cartoonist is that the material is always fresh. Last night, Lalo Alcaraz dedicated his presentation at Talento Bilingue de Houston to the four cartoonists who were murdered in Paris. 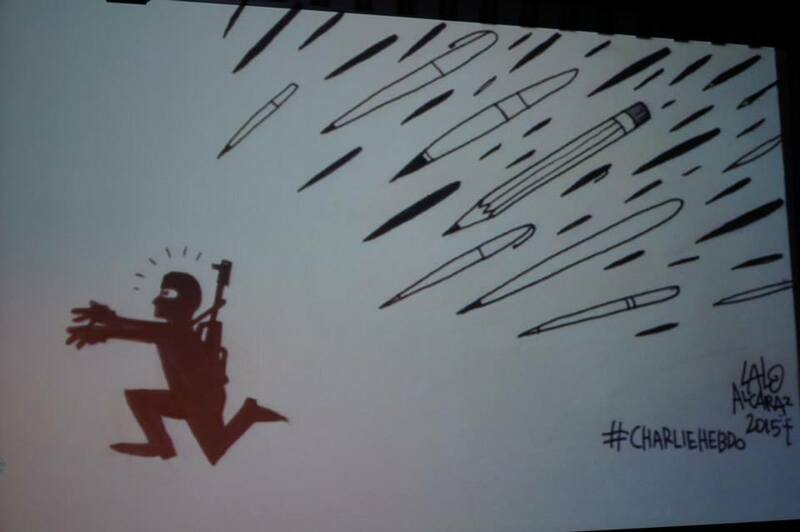 The drawing below was already featured on the BBC last night– hours after he drew it while flying into Houston. Of the violent day in Paris, Alcaraz stated that he’s gotten used to receiving death threats and racist hate mail from folks in this country incensed by his works, but he’s still thankful to be in the US. The presentation itself took us through some other current events, including Ayotzinapa, Mexico; Lalo’s latest work on Bordertown, which will be part of Fox’s Fall Line-up; and news that he is working on developing a series that mirrors his childhood. On top of that, a slide-show featuring some of his work from his strip, LA Cucaracha and some of his more popular editorial cartoons. Lalo takes his presentation to Austin on Thursday, January 8, next. 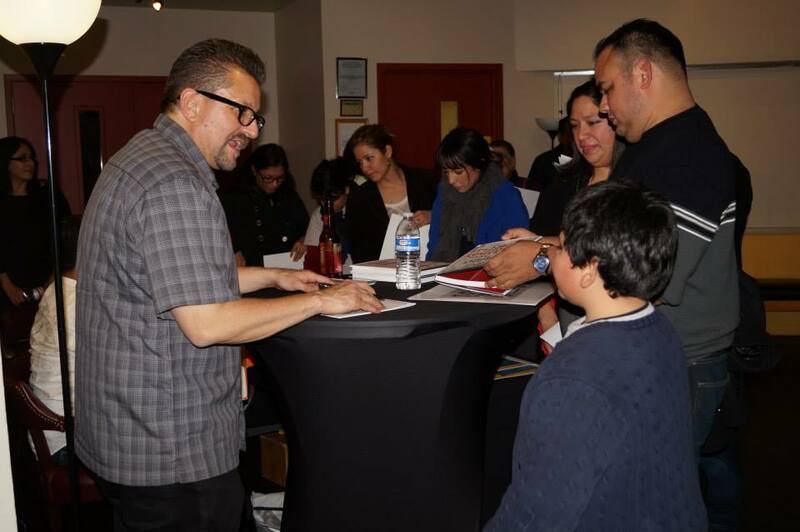 Beyond his presentation, Lalo enjoys meeting with fans, especially young fans. 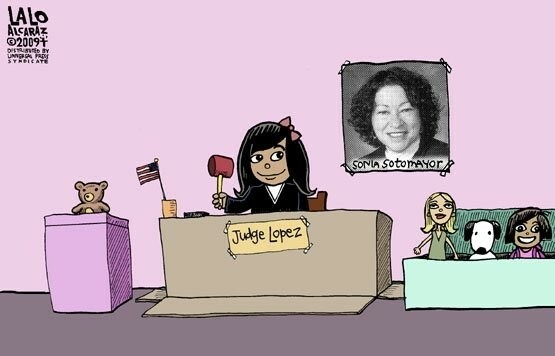 Among his more popular works is one that hangs on the wall of Associate Supreme Court Justice Sonia Sotomayor, which features his daughter playing “judge” with her stuffed animals, while looking up to the newest justice. That was definitely a popular print last night. And the Berkeley grad (Lalo) is definitely a role model for young kids as several came with their parents and posed with the cartoonist. Added to the usual advice given to young folks was something equally important: Always sign your name to anything you draw. Big kudos to the folks at Talento Bilingue de Houston and the Houston Arts Alliance for bringing Lalo to Houston for another visit. By the way, another hot seller was his 2015 Calendar. Get yours today! This entry was posted in 2015, Cultura, DC Promo and tagged houston, lalo alcaraz, talento bilingue, Texas. Bookmark the permalink.